EDF's headquarters in Tour EDF, La Défense, near Paris. Électricité de France S.A. (EDF; Electricity of France) is a French electric utility company, largely owned by the French state. Headquartered in Paris, with €71.2 billion in revenues in 2016, EDF operates a diverse portfolio of 120+ gigawatts of generation capacity in Europe, South America, North America, Asia, the Middle East and Africa. Its 58 active nuclear reactors (in France) are spread out over 20 sites (nuclear power plants). They comprise 34 reactors of 900 MWe, 20 reactors of 1300 MWe, and 4 reactors of 1450 MWe, all PWRs. In 2017 EDF took over the majority of the reactor business of Areva, in a French government sponsored restructuring following financial and technical problems at Areva. In July 2017, France's Environmental Minister Nicolas Hulot stated that up to 17 of France's nuclear power reactors — all of which are operated by EDF — could be shuttered by 2025 to meet legislative targets for reducing dependence on the power source. EDF specialises in electricity, from engineering to distribution. The company's operations include the following: electricity generation and distribution; power plant design, construction and dismantling; energy trading; and transport. It is active in such power generation technologies as nuclear power, hydropower, marine energies, wind power, solar energy, biomass, geothermal energy and fossil-fired energy. a low and medium voltage distribution system (1,300,000 km of lines), maintained by Enedis (ex-ERDF), formerly known as EDF-Gaz de France Distribution. Enedis (ex-ERDF) was spun off from EDF-Gaz de France Distribution in 2008 as part of the process of total separation of the activities of EDF and GDF Suez. EDF head office, 22–30 avenue de Wagram, Paris 8th arr. The EDF head office is located along Avenue de Wagram in the 8th arrondissement of Paris. The EDF head office is shared between several EDF sites in Greater Paris. Customers: 37.6 million worldwide in 2015. 2009 Turnover: €63.34 billion (23% from France) – €41.82 billion in 2002. Profit: €3.96 billion in 2010 – €3.96 billion in 2009. Net profit: €1 billion in 2010 – €3.92 billion in 2009. Net Debt: €34.4 billion in 2010 – €42.5 billion in 2009. Revenue: €75 billion in 2015. Energy generation: 619.3 TWh in 2015. EDF was founded on 8 April 1946, as a result of the nationalisation of around 1,700 smaller energy producers, transporters and distributors by the Minister of Industrial Production Marcel Paul. Mostly, a state-owned EPIC, it became the main electricity generation and distribution company in France, enjoying a monopoly in electricity generation, although some small local distributors were retained by the nationalisation. This monopoly ended in 1999, when EDF was forced by a European Directive to open up 20% of its business to competitors. Until 19 November 2004, EDF was a state-owned corporation, but it is now a limited-liability corporation under private law (société anonyme), after its status was changed by statute. The French government partially floated shares of the company on the Paris Stock Exchange in November 2005, although it retained almost 85% ownership as of the end of 2008. On 22 November 2016, French competition regulators raided EDF offices, looking for evidence that EDF was abusing its dominant position to manipulate electricity prices and squeeze rivals. Between 2001 and 2003, EDF was forced to reduce its equity capital by €6.4 billion total because of the performance of subsidiaries in South America and Europe. In 2001, it also acquired a number of British energy companies, becoming the UK's biggest electricity supplier. The company remains heavily in debt. Its profitability suffered during the recession which began in 2008. It made €3.9 billion in 2009, which fell to €1.02 billion in 2010, with provisions set aside amounting to €2.9 billion. In January 2013 EDF sold its 1.6% stake in U.S. utility Exelon for $470 million. In March 2016 EDF's Chief Financial Officer, Thomas Piquemal, who had argued that the final investment decision on building Hinkley Point C nuclear power station should be delayed for three years, resigned. With EDF's market value halved over the preceding year, the cost of the Hinkley Point C project now exceeded the entire market capitalisation of EDF. In March 2017 EDF offered a €4bn rights issue of new shares to increase capital availability, at a 34.5% discount. The French government committed to purchase €3bn of the rights issue. Shares prices fell to an all-time low due to the heavy discount on new shares. France is the world's largest user of nuclear power for electricity (78% of French production in 2007). 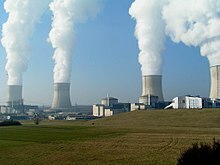 In May, 2004, the French Interior Minister Nicolas Sarkozy reasserted, in front of the French Parliament, the primacy of a nuclear power, much to the relief of labour unions of EDF. In this speech the minister re-phrased the famous slogan, "We do not have oil, but we have ideas", by declaring: "We do not have oil, we do not have gas, we do not have coal, but we had ideas". Depleted uranium from reprocessing the spent fuel of the 58 French nuclear power plants was exported from Le Havre to Russia in the last years and stored in Seversk where it was enriched, and the new fuel was exported back to France. In 2013 EDF acknowledged the difficulties it was having building the new EPR nuclear reactor design, with its head of production and engineering, Hervé Machenaud, saying EDF had lost its dominant international position in design and construction of nuclear power stations. In September 2015 EDF's chief executive Jean-Bernard Lévy stated that the design of a "New Model" EPR was being worked on, which will be easier to build, to be ready for orders from about 2020. In 2016 EDF's chief executive Jean-Bernard Lévy stated that EDF's 2030 strategy increased the emphasis on renewable energy, with a 2030 goal of doubling renewable energy capacity worldwide. He stated "I am convinced that we will still have a centralised and secure system in the future but it will be supplemented by a more intermittent and local decentralised system, in which customers will take charge of their consumption. In readiness for this, we must press on with research into electricity storage and smart electricity systems". In 2011, a French court fined EDF €1.5m and jailed two senior employees for spying on Greenpeace, including hacking into Greenpeace's computer systems. Greenpeace was awarded €500,000 in damages. Although EDF claimed that a security firm had only been employed to monitor Greenpeace, the court disagreed, jailing the head and deputy head of EDF's nuclear security operation for three years each. Two employees of the security firm, Kargus, run by a former member of France's secret services, received sentences of three and two years respectively. EDF's website was brought down by DDoS attacks three times in 2011, twice in April and once later in June. The attacks were claimed by the hacktivist group Anonymous. Three men were later arrested and interviewed on charges of "obstructing functionality of a data processing service", "fraudulent access of a data processing service" and "participation to an association formed with the aim of preparing such infractions". Motivations for the attack were thought to relate to the Fukushima nuclear accident in Japan. Unlike Switzerland and Germany, who plan to close down all nuclear reactors at the end of their lifespan, the government of France had no such plans to move away from nuclear power and three months after the Fukushima meltdown, stated a budget increase for nuclear power. The downtime of the EDF website cost the company an estimated €162,000. In February 2013 EDF Energy sought an estimated £5 million in damages from environmental activists from the No Dash for Gas campaign that occupied the EDF-owned West Burton CCGT power station in October 2012. It is unusual in the UK for companies to seek damages from protesters. On 13 March 2013, EDF dropped their lawsuit against the protesters, after agreeing a permanent injunction against protesters entering EDF sites. In 2017 EDF will take over the majority of the reactor business of Areva, excluding the fuel business, in a French government sponsored restructuring following financial and technical problems at Areva due to the building of new EPR nuclear plants. The reactor business has been named Framatome. The French government has contributed $550 million to a partnership by Électricité de France with Renault-Nissan and with PSA Peugeot Citroen. In 2018 EDF had plans to invest up to €25 billion in photovoltaics solar power generation, and introduce green electricity tariffs. As of 2017, EDF still held the business of 85.5% of France’s residential customers, though on a slow downward trend. SHEM (Société hydro-électrique du Midi): a subsidiary of SNCF, of which it produces about 1/3 of the electricity used by SNCF. A partnership agreement was signed with Electrabel. Among the other rivals of EDF, one can count a number of municipally governed companies, known under the generic term 'entreprises locales de distribution' ('local businesses of distribution'), who are electricity producers exploiting EDF's network. The nationalisation of electricity and gas on 8 April 1946, which profoundly changed the French electrical and gas organization, had however acknowledged the right of villages to keep their role in the public distribution of electricity and gas. In 1946, certain firms, villages or groups of villages, did not accept the proposal of nationalisation and created autonomous state controls (who held the monopoly of distribution, until 2004, in their area). To note, contrary to the initial idea, local controllers of electricity, have had, since 1946, the choice to continue to produce electricity. In fact, their production was rather marginal, except in Rhône-Alpes; having often preferred buying the majority of the electrical power from EDF. With the recent opening of the electricity market, local controllers are considering developing, augmenting and diversifying their own production, (e.g. Ouest Énergie, the subsidiary company of SIEDS) and/or to diversify their sources of supply. To date, the number of local businesses of distribution is approximately 170 and holds 5% of the distribution of French electrical power in 2,500 villages. Created by local authorities, they serve about 3 million people and represent 7,000 jobs. Around thirty of them – 9 during creation in 1962 – are federated in a national entity known as ANROC. ^ "Shareholding structure | EDF France". Edf.fr. 31 December 2016. Retrieved 30 March 2017. ^ "Fuel Mix". EDF website. Retrieved 21 September 2016. ^ a b "Areva outlines restructuring plan". World Nuclear News. 15 June 2016. Retrieved 25 June 2016. ^ a b "Green light for Areva restructuring". Nuclear Engineering International. 8 February 2017. Retrieved 8 February 2017. ^ a b Janet Wood, Caroline Peachey (21 March 2017). "Nuclear cracks are beginning to show". Nuclear Engineering International. Retrieved 28 March 2017. ^ "France could close a third of its nuclear reactors, says minister". 10 July 2017. Retrieved 13 July 2017. ^ "Activités". EDF website. Retrieved 11 November 2011. ^ "Enedis". Enedis website. Retrieved 10 August 2016. ^ "De EDF GDF a Engie: tout comprendre". Engie website. Retrieved 10 August 2016. ^ "EDF : Pierre Gadonneix a son bureau avenue de Wagram." Le Journal du Net. Retrieved on 25 November 2010. "Cependant, le siège social se situe intra-muros, avenue de Wagram, dans le 8e arrondissement." ^ a b Document de Référence (PDF). Paris: EDF. 2009. pp. 33–34. ^ Tiersky, Ronald (2004). Europe today: National politics, European integration, and European security. London: Rowman & Littlefield. p. 280. ^ Bennhold, Katrin (21 November 2005). "EDF shares fail to light up market". International Herald Tribune. Retrieved 11 July 2008. ^ "Shareholding policy". Électricité de France. 31 December 2007. Retrieved 5 April 2009. ^ "France's nuclear-energy champion is in turmoil". The Economist. 3 December 2016. Retrieved 3 December 2016. ^ "French become UK's biggest power distributor". The Independent. 20 November 2001. ^ "Electricite de France profits fall 74% on downturn". 15 February 2011. Retrieved 11 November 2011. ^ "EDF sells shares in US utility Exelon". Nuclear Engineering International. 14 January 2013. Retrieved 26 January 2013. ^ Michael Stothard (7 March 2016). "EDF finance chief quits over decision to push on with Hinkley Point". Financial Times. Retrieved 7 March 2016. ^ Terry Macalister (7 March 2016). "Hinkley Point nuclear project in crisis as EDF finance director resigns". The Guardian. Retrieved 7 March 2016. ^ Ward, Andrew (8 March 2017). "EDF shares hit record low after €4bn capital raise". Financial Times. Retrieved 14 March 2017. ^ "EDF eyes development of new, smaller reactors - papers". Reuters. 21 March 2013. Retrieved 18 April 2013. ^ Geert De Clercq (23 September 2015). "Only China wants to invest in Britain's new £2bn Hinkley Point nuclear station because no one else thinks it will work, EDF admits". The Independent. Retrieved 24 September 2015. ^ "Interview Jean-Bernard Lévy, CEO EDF: "Our Future Lies in Combination Nuclear and Renewables"". the energycollective. 18 October 2016. Retrieved 7 November 2016. ^ Henry Samuel (10 November 2011). "EDF found guilty of spying on Greenpeace France". The Telegraph. ^ a b c Nathalie Balsan-Duverneuil (26 January 2012). "Un "Anonymous" a été arrêté dans le département". Midi Libre. Retrieved 15 February 2013. ^ Dave Levitan (27 June 2011). "France Doubles Down on Nuclear Power". IEEE Spectrum. Retrieved 15 February 2013. ^ Elodie Gueguen (26 January 2012). "Des Anonymous en garde à vue". France Info. Retrieved 15 February 2013. ^ Ball, James (20 February 2013). "Activists claim police siding with power company EDF in lawsuit". The Guardian. Retrieved 27 February 2013. The action includes an injunction barring those named from the site, but – in an unusual move in the UK – also has a provision to recover damages, interest, and court costs from the activists. ... John Sauven, the executive director of Greenpeace ... "EDF's lawsuit represents the opening of a new front against peaceful protest"
^ Ball, James (13 March 2013). "EDF drops lawsuit against environmental activists after backlash". The Guardian. Retrieved 14 March 2013. ^ Nastu, Paul (13 October 2008). "French President Gives EVs, Hybrids Green Light". Environmental Leader. Retrieved 30 March 2017. ^ a b Cat Rutter Pooley (16 February 2018). "EDF revenues slip as nuclear pressures bite". Financial Times. Retrieved 16 February 2018. Wikimedia Commons has media related to Électricité de France.